Actor Bruce Willis isn’t exactly known for subtlety. This is, after all, the hero of multitudinous “Die Hard” pictures. Willis made the appearance on Friday night’s “Tonight Show” in support of his new movie, “Rock the Kasbah.” However, more attention was paid to Willis’ sartorial decisions than to the movie, according to Yahoo News. “What’s going on with the hair?” Fallon asked Willis. “It suddenly has just seemed to grow exponentially, and I was a blonde when I was a kid,” Willis responded. The hat and wig weren’t just a sly dig at Trump. Willis is a rare breed, one of Hollywood’s few conservatives. While he didn’t come right out and say he was voting for Trump, wearing the hat and wig appeared to be an oblique way of expressing his support. “Depending on the wind, really it just handles itself,” he added. 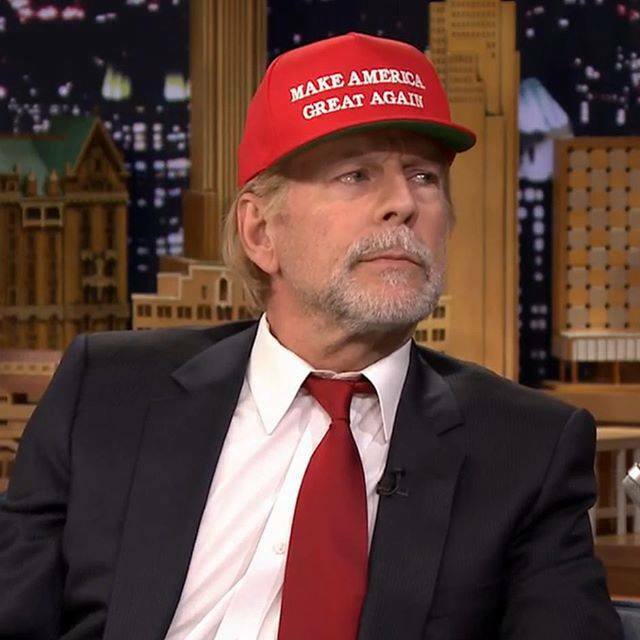 Willis isn’t the only person in Hollywood jumping on the Trump bandwagon this past week. In an interview with BET, Anthony Mackie — star of “The Hurt Locker” and “Captain America: The Winter Soldier” — expressed support for making America great again.